This sugar-ribbon cake makes a great centrepiece. If time is short, tie a beautiful festive ribbon around the cake instead of making one out of sugarpaste. 2. Paint on a little edible glue or royal icing to stick the leaves to the iced cake as you work, before they have time to dry out. You’ll need about 50 leaves in total. Add the silver ball dragees by pressing them into the sugarpaste (if it has set firm, attach them to the cake with edible glue/icing). 3. 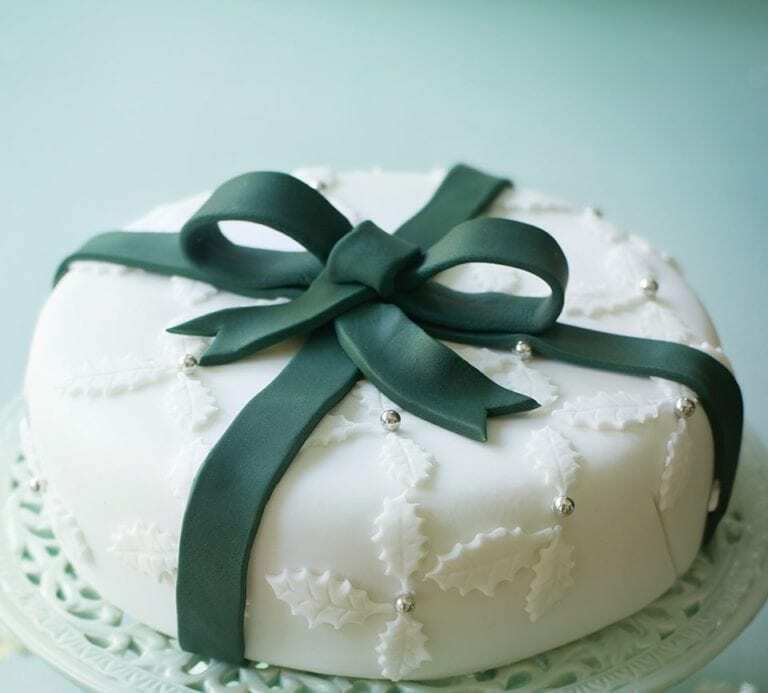 To make the green ribbon and bow, roll out the bottle-green sugarpaste into a long rectangle about 40cm long and 8cm wide (or long enough to wrap over the top and sides of your cake – measure it with a piece of string), to a thickness of about 4mm. Cut into 3 long strips about 2.5cm wide. Paint across over the top and sides of the cake with edible glue/icing, then attach 2 of the strips of green sugarpaste, trimming the 4 ends and tucking them under the base. 4. To make the bow, trim the remaining strip of sugarpaste to a length of 28cm.Fold the 2 ends into the centre, attaching with a dab of edible glue, and pinch together. Re-roll the green sugarpaste trimmings and cut out the 2 tails, each about 8.5cm long and 2.5cm wide with a ‘V’ at one end, and a 6cm strip for the knot. 4. Attach the bow to the centre of the cake with the edible glue/icing. Attach the two tails to the centre of the bow, leading them off at an angle. Finish the sugar bow by folding the small strip into a hoop and flattening it slightly as you stick it on the top to form the centre knot.